DOT held a town hall on the protected bike lane plan for Skillman and 43rd avenues in Sunnyside last night, and after much testimony, the key question remains the same: Will Council Member Jimmy Van Bramer support this critical street safety project for his district? Van Bramer called for a redesign last year after a driver struck and killed Gelacio Reyes as he biked home from work at 43rd Avenue and 39th Street. 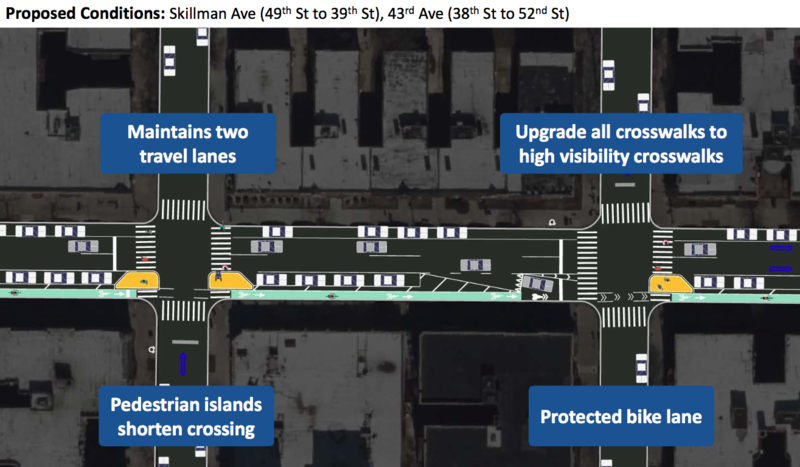 But when DOT put forward a plan to protect people biking on 43rd and Skillman, local merchants complained about the conversion of curbside parking to make room for the bike lanes, and Van Bramer said he didn’t support the project. 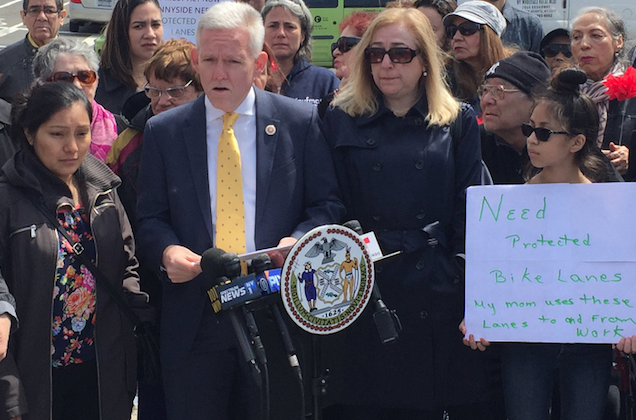 A year ago, Van Bramer stood with Reyes’s widow, Flor Jimenez, to demand the city make 43rd Avenue “safe for every single New Yorker, every single moment of every single day,” specifically with protected bike lanes. Protected bikeways on 43rd and Skillman would provide a safer bike route to and from the Queensboro Bridge for thousands of Queens residents. At the town hall yesterday, Jimenez addressed the crowd of about 300 people, speaking in Spanish with the help of a translator. Fighting back tears, she urged the city to redesign the streets for safety. “If something can be done, please do it, so there are no more families left as we are now,” she said. DOT has adjusted its plan since November, mainly to appease the cantankerous merchants by repurposing fewer curbside parking spaces [PDF]. Some of those changes will also result in a safer design — at a few intersections, for instance, the plan now calls for DOT’s new bikeway intersection treatments (the agency calls them “off-set crossings”) instead of mixing zones. The people who were opposed to the project before, however, remained opposed. O’Neill is wrong on a few counts. The safety record of protected bike lanes is unambiguously positive, with reductions in traffic injuries averaging 20 percent after implementation. There is no evidence, meanwhile, that claiming a few parking spaces to make walking and biking safer is detrimental to local merchants. New York has been implementing protected bike lanes on commercial streets for more than a decade. There are always some skittish merchants like O’Neill, but retail activity on streets like Kent Avenue in Brooklyn and Columbus Avenue in Manhattan continues to flourish. How can JVB remain undecided? What is left to decide? DOT amended their plan to appease the cranks and they remain upset. That’s a sign nothing can appease them and political courage – the courage to stop people from getting killed, one should add – is required now. Step up, sir. He can remain undecided because he is checking to see how the wind is blowing. He’s hearing from the anti-bike crazies, who are having success in influencing him. This means that bicyclists were wrong to ever have considered Van Bramer an ally. He is evidently unlike his colleagues Reynoso and Rodriguez, who support bicycle infrastructure on principle, out of an understanding of the benefits that it brings to the entire community. That’s what made me so angry. I thought he was one of the principled ones. Maybe I just wanted to believe that since he’s supported bike lanes in the past and he’s a CM for Queens (albeit densely populated eastern Queens), that he must’ve taken those positions on principles. And his husband is on the Board of Directors for Transportation Alternatives. But the about face he did on this was quite stunning. We’re talking saving lives v. private car storage. I hate pols who have no political courage. Take a stand and describe why and people will respect you more. Put your finger in the air to see which way the wind is blowing will always bring more grief. I disagreed with the soda tax, but that was strong leadership by Bloomberg. I respected him more after he pushed for it, even if the courts struck it down and I was personally opposed to it. Beggars can’t be choosers, Jimmy. You requested this! There’s no excuse to delay or table the plan, all the DOT did was dig into their toolkit of designs and copied-and-pasted treatments that they’ve been implementing for the past 10 years. Except for the offset crossings, none of this was new, go to http://www.nyc.gov/html/dot/html/bicyclists/bike-projects.shtml or even earlier and you’ll see repeating elements. And parking loss, and its backlash, was inevitable, it’s a zero sum game. What did you think the DOT will design, a tunnel? Requesting something from a municipal agency and becoming flat-footed with the results doesn’t look good for a politician. 2 fatalities and 280 people injured in a Vision Zero Priority Corridor, and you’re still on the fence? You either endorse or table the plan, but more importantly stop wasting our time! If I want theatrics, I’ll go see Hamilton. Possibly related: JVB opted out of public financing in his last election campaign. All this says to me that he’s abandoning whatever principles he had and becoming a typical pol. I assume he has his eye on higher office, but I’m glad he’ll be term-limited out of the council. If Mr Van Bramer is reading this article we, the residents of Sunnyside and Woodside, ask that he stand up like a man and represent the interests of the people who elected him. It is amazing how you could cover the town hall and not mention the fact that no matter how hard DOT tried to manufacture a positive response to their plan,80% of the people attending the meeting were against the proposal. This, by itself, is reason to not only delay but to cancel the entire project altogether. What is it with you people that you are willing to lie cheat and steal to try to force the will of a tiny minority on the vast majority who oppose this plan. We, the residents of Sunnyside and Woodside, are perfectly comfortable with the way things are in our community. Notice, I said OUR community. If you bike through OUR area you do so because you know that the area is already safe. If you don’t feel safe biking here we suggest that Astoria is very pretty these days and might be suitable for you bikers who obviously do not know how to bike safely. Again, Mr. Van Bramer, if you read this realize that you should be representing the will of your constituents. The time is now to be a man and stand up to the bully force representing a tiny minority. The time is now to stand up and say not only no but HELL NO to this assault on our freedom. We, the residents of Sunnyside and Woodside, have a right to expect no less of you. Sunnyside and Woodside aren’t gated communities. You don’t own the roads. I live in Forest Hills and need the lanes in Sunnyside and Woodside to get to the Queensborough Bridge. If you want to drive in NYC, go ahead, that’s your prerogative. But stop expecting anyone not in a car to bend over backwards to make it easier for you to park…at the expense of their own safety. As a driver, YOU are the minority here. Not the other way around. I, Would love to meet with you in person to discuss this.However, let me paraphrase you so you can get some understand. If you want to bike through Sunnyside and Woodside go ahead, there is no one stopping you. As you have said you should not expect everyone to go out of their way to make it easy for you. Riding a bike, like driving and parking is not a God-given right. If you do not feel safe there are other routes to the queensboro bridge. Also please get your facts staights. In NYC bikers are a tiny minority. According to DOT statistics less than 12% of new Yorkers ride a bike at least once a month on average. Dot stats also tell us that automobile use in this area is larger than bike riding by a factor of some 80 to 1. Even if these were not facts you are missing the concept that the local areas should have control over their streets. Let me give you an example. In Forest Hills where you are from there is near your major commercial area that has near it a residential area THAT HAS ONLY RESIDENT PARKING. This is clearly only for the benefit of residents. By your theory this should be disbanded first. Please do so and then we will talk about bike lanes here.